A lot of you got excited about the launch of our Storyboard function in Yellowfin latest Business Intelligence (BI) release – Yellowfin 6.2. Well, there’s now an additional feature that will make you love Storyboard even more. We want you to maximize your usage of Storyboard, to fully realize its potential and power – so we added the ‘Export Storyboard into PDF’ function. This function makes any presentation available, to any number of people, with a few easy clicks. Everything within a Storyboard, including its associated content, can now be exported into a PDF file. Contents may be in the form of reports, videos, text and images. It’s just one of the new additions to Yellowfin’s Collaborative BI capabilities, due for inclusion in 6.3. The ‘Export’ button can be found on the lower right-hand-corner of a Storyboard, and is made available in two modes: ‘Edit’ and ‘Preview’. After pressing the Export button, the ‘Export Storyboard to PDF‘ light-box will be displayed. From there, you’re given the option to ‘Export Comment’ in the PDF. 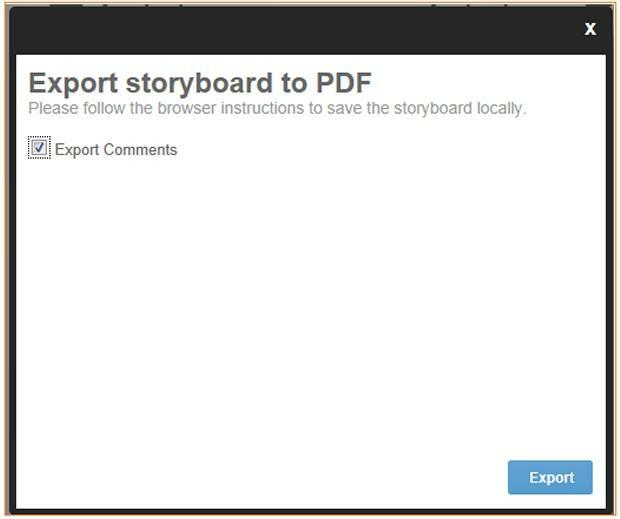 Selecting this checkbox will mean that the PDF export of your Storyboard will include all comments made on all content. This includes all comment threads and associated responses, as well as indicators that flag whether the issue being discussed is ‘Resolved’ and if users have marketed a particular comment as ‘insightful’. The final step of activating the ‘Export’ button on the light-box will start the export to PDF process. Whilst by now you are giddy with delight, please note that PDF export has some limitations. The export feature allows you to export your Storyboard slides as images. Therefore, if a report – embedded in a slide within your Storyboard presentation – is set to display both table and chart, a multi-page report or tabbed report, full report details will not be included in the export file. Simply put, it’s a PDF – your report content won’t have the same interactivity it normally does in its live Web-based state. The ‘Share’ function allows you to email the exported PDF version of any Storyboard. ‘Share’ and ‘Export’ functions are located next to each other. When you select the ‘Share’ function, the ‘Email Storyboard’ light-box will appear, allowing you to distribute your Storyboard to selected users.